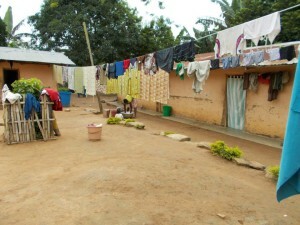 As someone who participated in the Ghana Clinic Project (GCP) solely in America and who never saw the work site on the other side of the world, I have unintentionally painted a two dimensional postcard image of the Wli Todzi village and its residents. 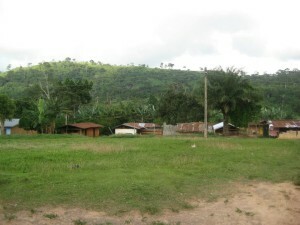 Wli Todzi is a remote haven in Ghana, situated on top of an enormous mountain bordering the neighbouring country Togo. 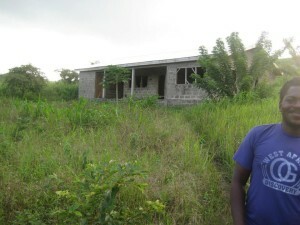 GCP’s current goal is to provide a clinic for the residents of Wli Todzi, realizing the struggles the villagers must face being isolated from any proximal health care by a steep mountain slope. 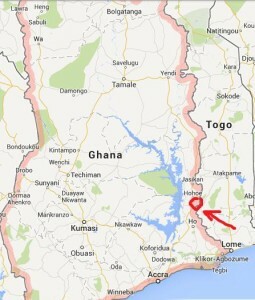 Six weeks ago I was granted the opportunity to fly to Ghana and see the village for myself. After finishing the gruelling trek up the mountain, I made my first impression of the village and, at first, found it to be parallel to the picture of the farm town utopia which I carried in my pocket throughout the numerous fundraising campaigns. Everyone in sight was so joyful and composed; it was hard to believe that struggle and suffering was present in this serene corner of the world. Soon after I and my travel team arrived a distant drum roll brought a crowd of rejoicing villagers our way. The crowd surrounded us, everyone carrying a wide smile and yelling “Wazo!” which in the local language of Ewe means “Welcome.” I have never felt so welcomed before. Their joy induced an impression that hardships never made their way up the mountain slope, lagging at the bottom together with high rise buildings, liquor bars and gasoline-breathing machines. As we walked to our temporary residency I got a view of the village. The houses we passed by were all clay huts with straw roofs. The village was organized in compounds of square formation with a courtyard in the middle. Every court was filled with freely roaming chickens and goats. We finally stopped at a court on the very edge of the village, dense jungle brush defining sharp borders where village territory ended. When we walked into the court the villagers brought us chairs and water. Children ran up to us to bat their eyes at our white skin and hold our hands as if we were relatives. For the rest of the day we were treated with kindness I have only expected from my family. Everywhere we went people were eager to greet us and shake our hands, smiling as soon as we made eye contact. When the night came the drummers came back, followed by a crowd of children. Their drums were embroidered with patterns around the taut leather skin, their priceless family relics. We were seated at a large wooden table facing the courtyard. Hefty fufu was brought to us, a white dense paste made from a local root cassava, dipped in thick ground nut soup. Four drummers sat in front of us and flung their palms at the leather. They collaborated in the same rhythm but creatively changed the beat to their own accord. Children from four years of age to their late teens lined up in rows in front of the drummers and began dancing in synchrony and singing in Ewe. As if following an invisible conductor they switched their dance moves from one to the other with incredible timing, every move different from the previous ones. My group and I stared at them in awe, impressed by the skill of the drummers and the intricacy of the dance. It wasn’t until the next morning that the burdens of people of Wli Todzi which shaped their desires started to bleed through my idealistic postcard image. I walked out of my little room soon after sunrise the next morning. I didn’t know where to start scratching. Despite the mosquito net the local bugs ended up having a feast on my body while I was sleeping. While standing aimlessly and watching the courtyard something peculiar caught my eye. I felt like I walked into the Never-ever land from the story of Peter Pan. Most people working in the courtyard were children no more than fifteen years old. Some were doing laundry some were hauling water from a distant river while others were herding goats and tying them up to poles so they wouldn’t run away. The only adults were an old lady cooking in a hut with a straw roof and a younger woman spindling a basket in the corner. I sat outside and watched them do their daily chores until Jeremy, who has been working on the clinic project for the past two years, came out of his hut. “Why are there so many children here?” I inquired. He has been working with Wli Todzi on the clinic for a long time and was full of useful information. “What? !” the ratio seemed unnatural. “Why are there so many orphans? What happened to the parents?” I asked the obvious question. “Going down the mountain pregnant? !” I thought of the trail up the mountain to Wli that the team and I have hiked. Many parts were so steep our hiking boots slipped on the coarse rock. On some parts it was necessary to scale up an almost vertically sloped rock while using a metal rod for support. A few of our trip members almost lost consciousness from exhaustion, reporting “seeing black at times.” The trek up took us three hours. When we went back three days later some slipped and hurt themselves. It took us an hour and a half to get back down, and even then we congratulated ourselves on our endurance. I scanned all the hard working children around me. I felt deep pangs of sorrow for what their mothers must have endured in the last hours of their life, and how hard it must be to live with no parents in a self-sustaining village. “Sarah over there,” Jeremy nodded his head in the direction of the young lady weaving a basket, “she had a birth complication in the village and went into a coma. Fortunately she made it until she was brought to a doctor and survived. Such an occurrence is so rare that she was given a ceremony when she came back to honour her perseverance.” I looked at her with deep respect. “Why don’t they come down before going into labour?” I asked. “Because most of them can’t afford to stay outside of home indefinitely,” Jeremy replied. I sat looking at the courtyard for another hour, digesting the harsh truth in my head. I had no reference point to even imagine what the lives of these children were like. Their hardships were outside of the scope of my narrow view of the world. Later that day I was able to take my mind off the looming thoughts when we went to see the clinic. The view that opened in front of Jeremy and I when we arrived at the construction site made me start skipping, laughing with joy. I have seen probably a hundred pictures of the clinic, but none of them gave full credit to its beauty. The building stood on a rising, its glass lensed eyes of windows staring into the jungle and beyond, all the way to the horizon where the hills bleached into the blue sky. The building itself was cement walls and an aluminum roof, but one did not need to be a construction worker to see that it was an embryo of an elegant and practical structure. I walked through every room, letting my fingers trail alongside the rugged brick walls. Right away I saw where the lobby would be, where the patients would come in and be greeted by the receptionist, where the hospital beds would line the wall, where the medical supplies will be stored and where doctors would reconvene to make life saving decisions. Every room had at least two windows, offering patients the priceless medicine of the beauty of the land around them. If I ever fell ill I would be blessed to be treated in a place like this. It made me suddenly realize how every minute I spent fundraising was the most meaningful and world changing minute of my college career. I walked out into the porch to catch my breath and enjoy the scenery. I noticed a boy in his teens walking in my direction. I greeted him and asked him what he was doing. “I come to make shore you are OK.” He said with a heavy accent. I tried to start a conversation while shovelling the rocks that accumulated from the construction out of the hallway. “Are you from Wli Todzi?” I started with a banal question. “Yes. I live over der,” he pointed to his right. “Oh OK… do you two live together in the same room?” I was curious about how the family housing dynamics played out in the village. “So you live with your sister?” I tried to clarify. “It OK.” He talked as if he was mentioning a recent haircut he got. I stopped shovelling and entered a state of stupor. Again I was reminded of death which seemed so familiar to the villagers. I have met people before who experiences loss so many times that they delved into the subject without discomfort, but they were always old, very old. Edem, as I found out later, was only fifteen. He looked at me confused as to why I stopped shovelling. “Let me help,” he interrupted me and jumped to my aid. “OK, let me know when you get tired and want to switch off,” I told him. “OK.” He wrapped a bandana around his mouth and began shovelling with ferocious speed and determination, sending clouds dust in the air. Within the next hour the whole clinic was swept clean. On the way back I noticed that someone put a log across the trail as thick as my neck, both of its ends disappearing into the bushes. Without giving it much thought I walked up and stepped over it. Only when it was between my legs did I notice that the log was moving. I discriminated the diamond shaped patterns on its skin. I screamed and ran for the village. Edem met me catching my breath in front of one of the huts. He looked calm as always. “Was that a snake?” I asked him, panting. “Yes,” he said smiling, obviously amused by my bewilderment. “So it could have killed me?” I rapid fired the question. “Oh yes, children disappear often,” he said, again breaching a morbid subject without wincing. When I got back to our court I inquired Jeremy about the prominence of snakes on the mountain, but he was wise to play dumb and not feed my paranoia until we were off the mountain. But after the descent he disclosed to me that yes, there are plenty of poisonous snakes and other critters on the mountain, some with venom that kills within five minutes, and yes, the locals are constantly exposed to this danger without any medical protection. I came down the mountain with a much deeper understanding of the cause for constructing the clinic than the limited view I had going up. People of Wli Todzi are not blindly jumping into development just to keep up with the rest of the country. They are not unwillingly leaving an innocent and ancient paradise behind. Most of them get out of bed at four or five in the morning to plough the harsh soil with minimal tools or bare hands all the way until sundown, then go to sleep and start it all over the next day. They have nothing but prayer and hope to protect them from the dangerous environment they are exposed to every day; the invasive infections, deadly animals and complications of child birth. Never again will I wonder if this striving for development comes at a cost of decaying an endlessly complex and unique culture. Their grip on ancestral wisdom is stronger than any lure of luxury the Western World could offer. Their desire is not to change but to enrich their lifestyle, using commodities that are readily available to everyone else in order to have leisure time, to interact and enjoy each other’s presence and to escape the obligation to protect their life on a daily basis.